The foundation of any stainless steel casting company is its stainless steel foundry, which is where the stainless steel casting process takes place. This refers to the process of “investing” a pattern with refractory materials, molding from among many different stainless steel casting grades to create precision castings. For each stainless steel casting made by a stainless steel casting company, there is a general process that is followed to ensure quality, cost-effectiveness, and consistency. This process should be watched over by an experienced staff to ensure that all processes are strictly followed. First, the pattern is produced and a mold (also known as the metal die or master die) is created. This is an intricate process, as it involved the consideration of expected shrinkage of the wax pattern, the ceramic material, and the stainless steel casting itself. After the mold has been created comes the wax pattern production and assembly. 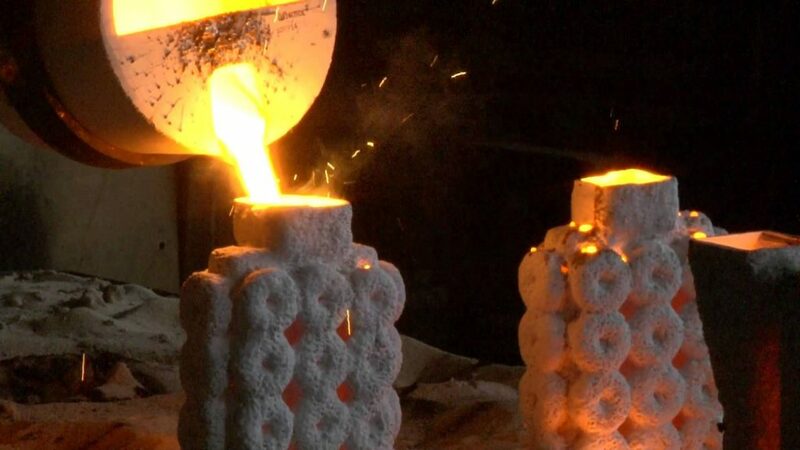 As each casting part requires its own wax pattern, the number of wax patterns produces depends on the number of castings that will be required. During this process, hot wax is injected into the mold and solidifies, eventually creating an exact replica of that part that will be made. Once the mold is created, it goes through a heating process to increase the strength of the mold and eliminate any leftover wax. Then, molten stainless steel is poured into the mold while it is still hot, with the liquid metal flowing through into each mold cavity. After a cooling process comes the shakeout, or divesting process, where the casting gets removed from the molding pattern. Finally, the finishing of the cast involves grinding or sandblasting the cast to smooth it out and remove any imperfections. When you are looking for a reliable stainless steel casting foundry in China, the experience can make all the difference. An experienced stainless steel casting foundry understands the needs of their clients as well as how to turn visions into reality in an affordable, quality way. In field of stainless steel casting, quality stainless steel castings saves buyers both time and money, creating an efficient workflow. At CFS Foundry, we have over 20 years of experience, which has allowed us to create a streamlined process that benefits both us and our customers. This experience has allowed us to create a reputation based on delivering quality stainless steel castings to our customers along with top of the line customer service. When you are working with an experienced stainless steel casting foundry with a strong reputation, you don’t have to worry about the lack of quality in their castings. We pride ourselves on creating durable stainless steel castings and a higher quality product than our peers, offering you high quality on the first attempt. You also know that we are by your side if anything goes wrong, or if you need more help, as our strong customer service track record shows. At CFS, our stainless steel foundry is located in Ningbo, China, which takes 40 minutes driving from our factory to Ningbo harbor. It is located in an industrial park with a series of machining factories, heat treatment factories and surface treatment factories around. Set up as a manufacturer and exporter, this allows us to offer world-class quality but low prices for our customers from UK, USA, Canada, Australia, South Africa, ect. Our staff at the foundry has a rich casting experience, education, and is bi-lingual, allowing for a close overseeing of the stainless steel investment casting process from start to finish. Our unique geographical advantages allows to supply both raw castings and finished machined or polished stainless steel castings for our customers, giving us sustainability and the ability to adjust as quickly as possible to the needs of our customers. Any inquiry on stainless steel casting, pls ontact us by email cathy.sales01@cnool.net. We are happy to offer a good solution for your casting project with high quality.